I’ve been dying to see the new Jane Eyre adaption for a while now, and when it came out, I was bummed to find that it wasn’t playing nearby. I live near NYC, but taking a train for 40 min to an hour each way, getting on the subway to get to a theater, etc etc = dude, too much work for a movie, even if it is Jane Eyre. So after ranting sadly to the Mister, he pointed me at this list of theatres, and I saw that the movie would be playing in a town only 15 minutes away on 3/25. YES! I’m so glad that we tend to get lucky with the limited release movies over here. Anyway. I liked it. I think this version did a really good job with the creepy parts of the story, and the locations used were spot on. There was a dark gloominess in the visuals in this version of Jane Eyre that I liked, but it wasn’t overbearing – it contrasted nicely to the scenes with light. There was a time or two where there were hand-held camera shots, which is not my favorite device to show agitation of the characters, but thankfully it was only used a time or two. I thought that Micheal Fassbender did a good job in his Rochester. Grumpy and a little intimidating yet with a glint of humor and pleased surprise when he interacted with Jane. I was (like many I think), worried about Mia Wasikowska’s portrayal of Jane after her performance in Alice in Wonderland, but her blankness worked when it came to Jane’s reserve. If I were to nitpick I would have preferred to see a little bit more nuance in her facial expressions. She can’t seem to convey more than a sort of outward calm, slight confusion, or utter crying upset. I thought the actor who played the younger Jane Eyre was better, to tell you the truth. Wasikowska had some great lines though – I think Jane got the most laughs in this movie for her deadpan responses to Rochester. 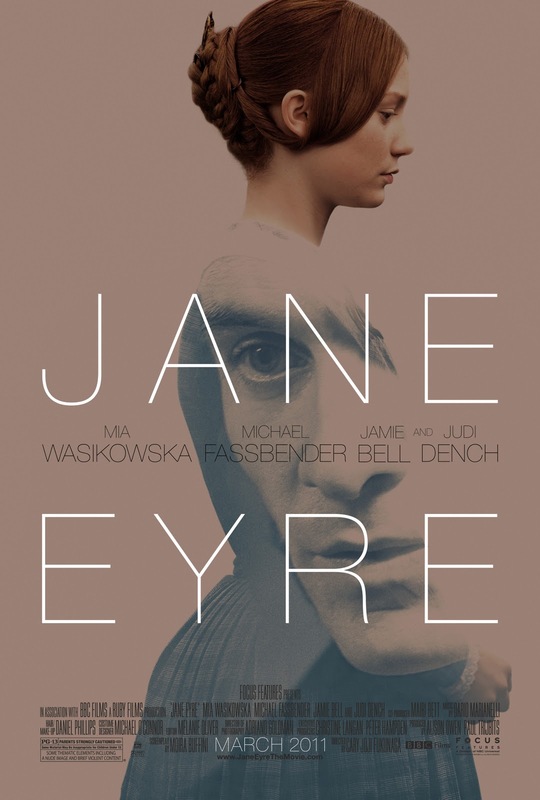 The move was 115 minutes (just under two hours), and it did well in showing the story, although there was a scene that was hoping to see that I didn’t, and I wished it was a bit longer because I felt like although it did show Jane and Rochester falling for one another, it still felt a bit truncated. I have to say I don’t have the 2006 Masterpiece Theatre miniseries version of Jane Eyre to compare it to. I suspect I will like the miniseries better just because with these adaptations, I find that I like the longer versions better. And for the response of a total Jane Eyre newbie, my husband liked it too. I was afraid he wouldn’t, since he fell asleep during North & South (the horror). ETA: Husband says that because the movie began with Jane hearing her name being called in the wind, he thought she hearing voices and thus crazy. He also felt like the movie didn’t show enough of Rochester/Jane falling in love, but this only served to prove that Jane was insane. HAH. I’m so amused. This entry was posted in movies and tagged charlotte bronte by janicu. Bookmark the permalink. Is it showing in your area? Hope you get to see it. The limited release thing is silly. I am so glad you reviewed this! I’ve been DYING to see this movie, and also realized it only available in limited theaters. Bummer! There is one close by to me, so it’s all good. This movie looked like it really took the creepy route- but that’s partially what intrigues me. Plus, I definitely agree with you about Mia. I really didn’t like Alice in Wonderland for a lot of reasons and wondered how she’d hold up to his literary classic. Awesome! Thanks for your thoughts! I can’t wait to see this! Yay for having a showing nearby! Waiting to see how you and others liked this one. I think overall I was happy I went and saw it. I’m so excited to see this movie however I have to wait some more time until it comes to Germany. Hope you don’t have to wait long! Ooh. Thanks for the review. I’m still waiting very impatiently over here. I didn’t see Alice in Wonderland, and though I enjoyed the 2006 version, I didn’t love it like so many others did. Toby Stephens is cool and all, but I liked him better in the BBC The Tenant of Wildfell Hall. And Ruth Wilson didn’t quite gel for me. So I’m excited for this one. Also, I am sitting here agape that your husband fell asleep during North & South. Whaaaa? Interesting.. hmm, I wonder how I will like the Jane Eyre mini-series then. And I haven’t seen the Tenant of Wildfell Hall either! I know. I married a guy who FELL ASLEEP during N & S! That is just crazy. You pointed out something that I was a little wary of: “I was (like many I think), worried about Mia Wasikowska’s portrayal of Jane after her performance in Alice in Wonderland, but her blankness worked when it came to Jane’s reserve.” Phew. I liked Mia’s performance in Alice in Wonderland but I wondered how expressive she’d be when it came to Jane–you confirmed my suspicions on her facial expressions, lol. Anyways, thank you for the review! I’m still impatiently waiting for this movie to be released! He only revealed this side of himself after we got married. Very suspicious. Alice in Wonderland was a real letdown. I felt like her performance was part of it, but it’s much better in Jane Eyre/suits her character in Jane Eyre better. Your husband fell asleep while watching North and South?! But whyyyy? Anyway, I’m glad you reviewed this one. It’s still not showing over here because we get films (and books) later that you guys but I’m glad you liked it. I just need to find someone to watch it with me. Or maybe I could watch it by myself. LOL I do that sometimes. Because there is something WRONG with the man! I don’t understand it either. I am seriously jealous right now that you’ve already gotten to see this one. I too am a bit worried that they won’t be able to translate the depth of the story in only 2 hours, but we’ll see. I’m just glad to hear it was worth seeing and not a total bust. I really lucked out in where I live. Yes, it wasn’t a total bust for me. I hope it isn’t for you either when you finally get to see it! Now that I’ve seen it I think I understand what you’re saying about Mia – I wanted more from her at times. She was too dry and wooden for me in some scenes. Fassbender was great as Rochester though, if a little too good looking. He would make a great Vaughn. 🙂 Maybe I’ll do my own review post of the movie but I don’t want to give too much away. I definitely missed that missing scene. I think a lot of fans will be disappointed in its exclusion. I also wanted a little but more from the ending. Overall a great adaptation though. If I have a chance I’ll see it again in the theater and will be buying it on Blu ray when it comes out. Thanks for the review! Btw I hope you will see the miniseries soon! Its very well done even though not everyone loves it. Def worth seeing. Yes, it’s a bummer about the missing scene. I guess maybe they decided it couldn’t be pulled off? Oh well. If it’s on the DVD/Blu Ray as a deleted scene, that would make my day. I really have to get my hands on the miniseries. I saw it last Friday and, for the most part, enjoyed it. Honestly, the first twenty minutes were tough for me to watch. (In fact, a loud collective gasp went up in the theater after one specific moment during those first twenty minutes.) And because of that, I agree with you completely re: the young Jane; that actress did a wonderful job. The tone of the film struck the right chord for me, and both Fassbender and Wasikowska had their moments, but Bertha was all wrong. Just…wrong. I’m very happy I saw it and will watch it again – perhaps skipping those first twenty or so minutes – when it’s released on DVD. We didn’t have a loud collective gasp! So I’m not sure.. Oh wait! Was it when she was a kid? There was one part. Yes, there’s this helpless anger in what she goes through that I felt reading the book which is done well in the movie. I hate her cousin! AHH. Yes, that wasn’t how I imagined Bertha at all, but she had such a small part so it wasn’t a deal breaker. And did we even see a Mrs. Poole? Maybe a glance.